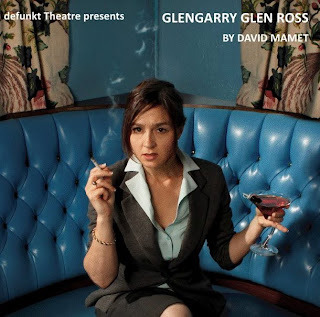 Diggin' to China: It's (not just) A Man's World: defunkt Theatre takes on machismo, Mamet, and more in "Glengarry Glen Ross"
It's (not just) A Man's World: defunkt Theatre takes on machismo, Mamet, and more in "Glengarry Glen Ross"
David Mamet's Pulitzer Prize-winner Glengarry Glen Ross, perhaps not the first play that jumps to mind when one thinks of the Drammy award-winning work being staged at defunkt Theatre, know for such adventurous works as Sarah Kane's 4.48 Psychosis and Martin Crimp's Attempts on Her Life. But a second look at Mamet's heightened dialogue one realizes the masterful wordsmanship is as experimental and stylized as any deconstructed modern masterpiece. However not one to simply trot out Mamet's exploration of masculine cruelty under the gun of economics, defunkt has brilliantly cast two pivotal roles, Richard "Ricky" Roma and Shelley "The Machine " Levene with two phenomenal actresses-(Grace Carter and Lori Sue Hoffman in their return to the stage!) It's a testament to defunkt's fearlessness and focus and not stunt casting. Directed by Tamara Carroll and featuring uniformly stellar performances from a cast with a collective five Drammy wins*. The Aformentioned Carter and Hoffman co-star with Spencer Conway, David Bellis-Squires, Matthew Kern, Garland Lyons, and Tom Mounsey in a timely tale of deception, greed and damaged male ego boiling over in a Chicago real estate office. The basic plot is that in one week, all but the top two salesmen will be fired, sparking a devastating chain reaction. The profanity laced all-male script was adapted by Mamet into a critically acclaimed (though commercially poor performing) film in 1992 starring Al Pacino and Jack Lemon. Written in 1984, Glengarry Glen Ross has become only more timely in light of the current economic downturn. defunkt Theater, who thrive in the realm of risky, challenging works (Willamette Week chose defunkt as "Essential Theater " deeming them the very apt "Good Taste" theater) have ingeniously queered Mamet's hyper-masculine text with mix gendered casting and with Matthew Kern's portrayal of the somewhat villainous office manager/whipping post Williamson at whom emasculating, homophobic barbs are launched as a gay man. With Carter and Hoffman inhabiting the male roles the play becomes an exploration of women thriving and surviving in "a man's world" and what that means to femininity, compassion and gender dynamics. It becomes the accidental feminist, a document of the destruction of the American dream. Ripping open the dying carcass of the American dream and laying bare the lies it takes to close the deal, make the sale, sully the soul defunkt Theater have by far one of the most unexpectedly vibrant and exciting productions being staged this fall. We've come to expect no less from them. defunkt Theater does more on a small budget than anyone else in the Pacific Northwest, having more pay-what-you-will/can nights than any other theater company in Portland. Their passion for theater makes vibrant, important works of art accessible to anyone on any budget. Oct. 14-Nov. 19, 8 p.m.; The Back Door Theater, 4319 SE Hawthorne St.; $20; 503-481-2960 or defunktheatre.com.